The CM Tooltip Glossary Pro+ plug-in is designed to integrate with Google Translate via an API that works directly with the plug-in to feed translations of highlighted phrases or term descriptions on your website in the language of your choice. It works with all the different languages that Google Translate supports. Language translation can help with explaining the meanings of your specific vocabulary items and technical terms to visitors that may be unfamiliar with the nuances of its regional language, or when you want to explain the etymology of a word’s meaning by referring to its use in the original language or native tongue of the speaker. The CM Tooltip can be set to show the original content of the phrase or word’s definition, together with the translated version in the defined language chosen in the tooltip plugin settings. 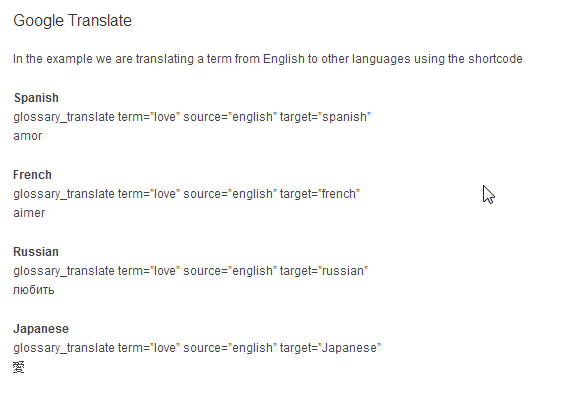 Users can control whether each term shows or hides Google’s term Translation. 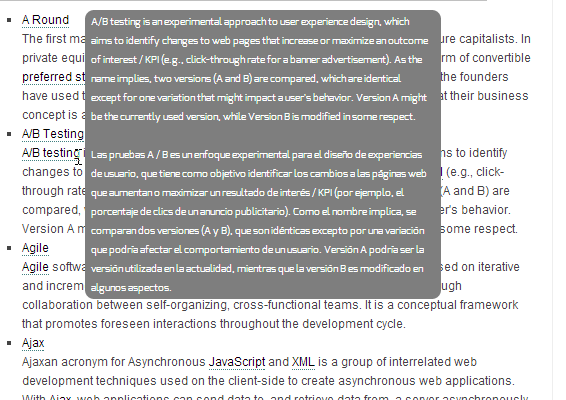 CM Tooltip has a Google Translate Shortcode that can be inserted into any post or page on your site. The Shortcode supports both the source and target languages, giving the user the ability to show the translated versions of term definitions in many different languages on the same page simultaneously.